There wasn't really anything important there, but there were some old photos of people I haven't seen in years, and there was stuff missing because Myspace didn't actually do that great of a job of holding onto all my old stuff ("Where ARE those old blogs?"). It's hard to believe that Myspace was King of All of Social Media at one point. True, it was one of those boyish kings that didn't wear the crown particularly well. Facebook was pretty much the same thing in the beginning, but over time it matured (relatively speaking) and more importantly, it works. As much as we complain about Facebook, we mainly complain about the ads and the privacy issues. But you can always get into Facebook -- it works on my phone, it works on my desktop. I can use it here or there, I can use it anywhere... And it's never slow because too many people are using it anywhere and everywhere. Facebook won because it got Grandma and Grandpa online. Really, old folks got computers just so the could see what their grandkids were doing on Facebook. And if your system doesn't work, you aren't gonna get the old folks online. 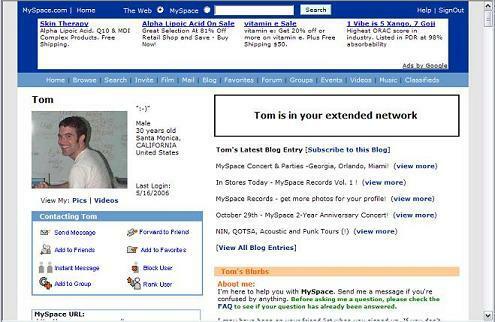 Myspace went a different direction when it was dethroned as the Social Media King. It decided to focus on music and art. A great place to promote your band. I can follow you, but you don't have to be my friend (which means I can see your stuff but you can't see mine). A good model when we're talking about privacy. So I figured, while I'm collecting some old photos from my old Myspace account, I'll listen to some of that music. Oh, sure, when I typed in "jazz" I got some rap group to show up on my screen with some grainy video rapping about the Jazz, man. But when I searched for music I actually wanted to hear, it didn’t play. It’s still sitting there as I write this blog, saying it’s got a bunch of music queued up for me, but not streaming a single note. I hate to state the obvious, but this is what makes or breaks online enterprises. Does it work? Not is it cool, not questions about selling your data like ello is trying to prove with their ad free social media site. We will give up a lot of privacy, clean design, and fun tools for an ugly, invasive product that actually does what it says it's going to do. I understand the challenges of taking something that wasn't made for 1,000 people hitting it in the same second (or in geek talk 1,000 TPS load). Success can kill you -- see my 2010 blog I'd Love to Have That Problem. A million people showing up when you can't serve them is a lost opportunity. But Myspace didn't die. They just didn't get any better. It's slow. The navigation is hard to use, and it... just doesn't work.